This article will show you how to integrate PayPal Payments Pro (with PayPal Express) into your 3dcart account. When you integrate PayPal Payments Pro on the store, PayPal Express will also display on your website. If you would like to integrate PayPal Express on its own (without PayPal Payments Pro) click here. Here's a brief description of the differences between PayPal Payments Pro and PayPal Express so you're aware of how they each behave. This account will not redirect the customer to PayPal to accept payment. The transaction is completed on your website and the payment method displays as credit card fields. This payment method displays as a PayPal logo and opens up a pop up for the customer, allowing them to log into the PayPal website to complete the transaction. Due to PayPal standards, this logo displays on checkout step 1 or prior. This way, the customer does not have to type in their personal information twice (once on your site and once on PayPal's site). On the next page, click on the "My Selling Tools" link on the left. 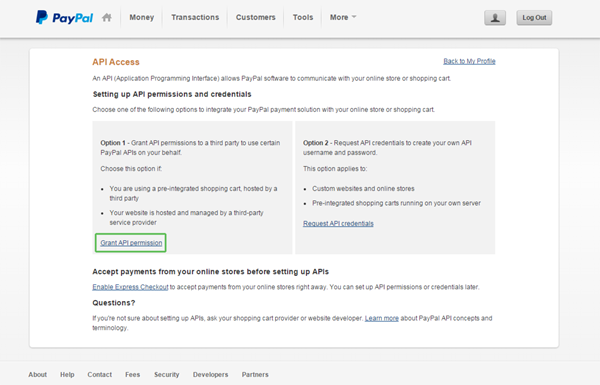 Then, look for and click on the "Update" link located to the right of "API Access" as shown below. On the following page, You will be given two API options. In this case, you will select Option 1. Click on the "Grant API permision" link in Option 1 as shown. PayPal's interface will refresh and show you a list of all possible permissions available to the API. Check all boxes shown below. There is one permission that it not available and will need to be left unchecked. It is labeled "Generate consolidated reports for all accounts"
After selecting all the shown checkboxes, click add to grant API access. API access is now granted for your PayPal account. 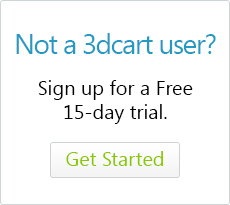 Next we will set up your Payment Module in the 3dcart store. 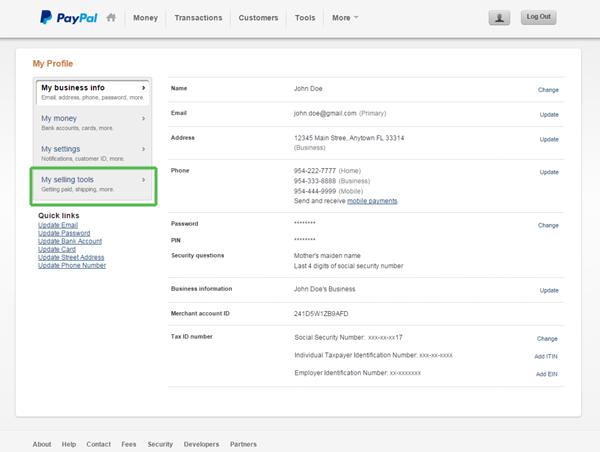 Once you have granted API access in the PayPal console, log into your 3dcart Online Store Manager. 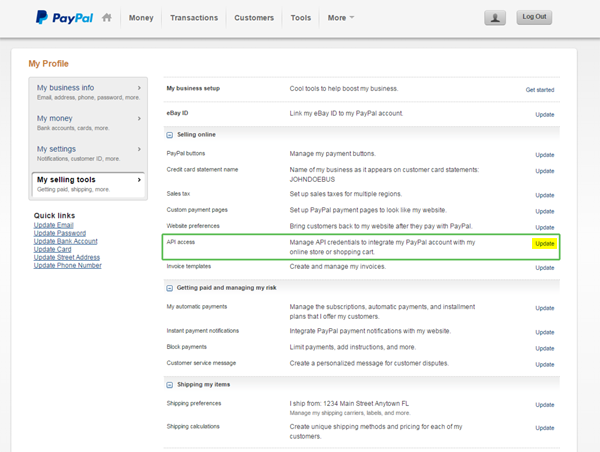 In the Payment Method field, scroll down to the "Alternative Payments" section and choose PayPal Payments Pro. Remember, if you have a PayPal Payments Pro account, it will automatically integrate PayPal Express when you add the Pro method. Also, if you're looking to only add PayPal Express, you can find the steps outlined here. 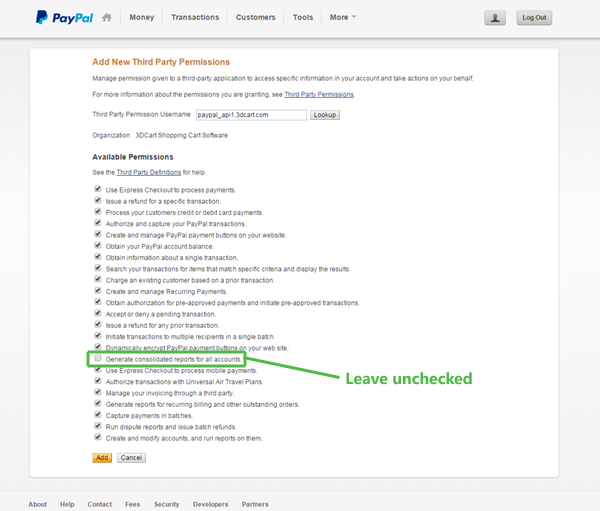 Marking this checkbox will make it so that your shopper can complete begin the checkout process on PayPal's side but without having to create or log into a PayPal account. Your store is now set up to take orders using PayPal Payments Pro. As mentioned, PayPal Payments Pro automatically adds PayPal Express as an additional payment option. In previous versions of PayPal Express, the customer would be redirected (from your store), to the PayPal Express login pages to complete their transactions.